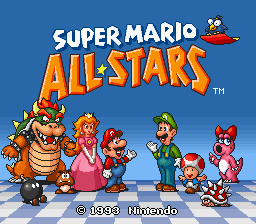 Right before the "lights" come on and illuminate the title screen, the crowd of Mario characters are chatting up a storm. 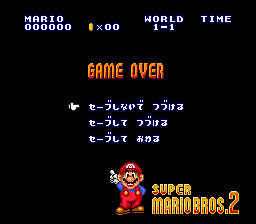 Even though you can't really make out any words, the crowd chatter sound clip was changed for the U.S. version. 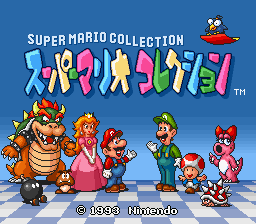 The Japanese title screen has "Super Mario Collection" in English above its title logo. 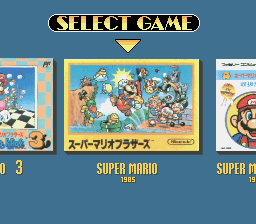 In the Japanese version, if you press Start during the "darkness," the screen immediately fades into the Select Game screen. 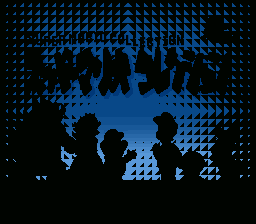 In the U.S. version, pressing Start during the "darkness" will turn on the "lights" first, showing the title screen for a few seconds before fading out. 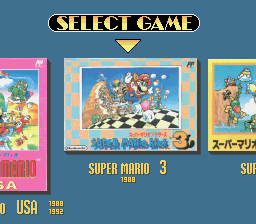 On the Select Game screen, the Japanese game boxes were replaced with the American versions. 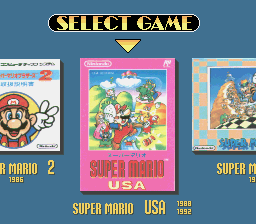 The U.S. version's Select Game screen has a brighter background, brighter text, bigger shadows for the box art, and the arrow has a white outline instead of black. You might recall that the Japanese SMB2 was a completely different game from the American SMB2. 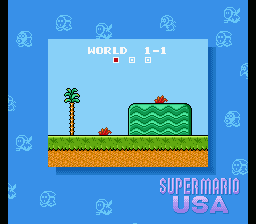 Gamers in North America finally got to play the original SMB2 in All-Stars, where it was titled Super Mario Bros.: The Lost Levels. 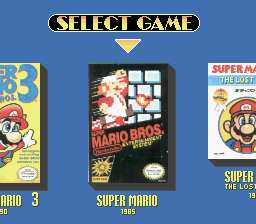 To create the Lost Levels box art for the U.S. version, the designers replaced the black "Family Computer Disk System" text with "Super Mario Bros.," and the red "Super Mario Bros. 2" text with "The Lost Levels." 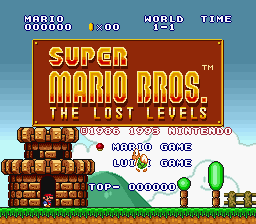 The last half of the black text from the Japanese box reappears as the third line on the Lost Levels box. 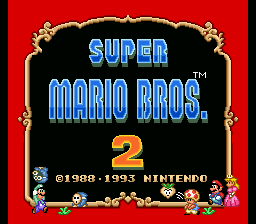 The American Super Mario Bros. 2 was released in Japan in 1992 as Super Mario USA. 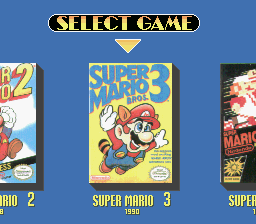 The year under "Super Mario 3" was updated for the U.S. release. 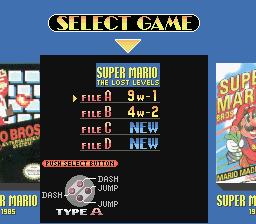 Next, we'll choose The Lost Levels to pull up the file select menu, which has even more color differences. 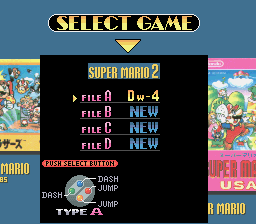 Most notably, in the Japanese version, the file labels are pink, and the controller buttons match the colors on the Japanese Super Famicom controller. 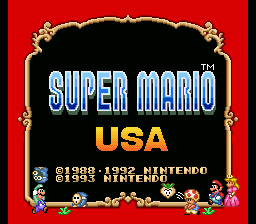 In the U.S. version, a trademark symbol was added by the Super Mario Bros. title logo. 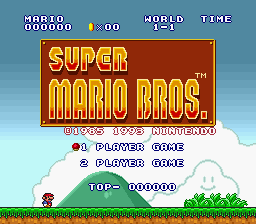 Note that the original NES version does not have a "TM" on its title screen. 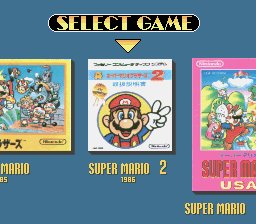 Here we can see the different title logos used for the Japanese SMB2, a.k.a. 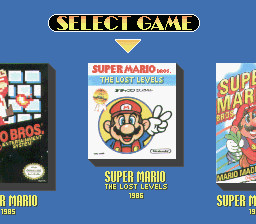 "The Lost Levels." 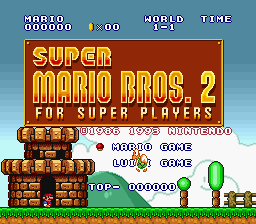 The new "For Super Players" subtitle comes from the gold seal on the Japanese SMB2's packaging. 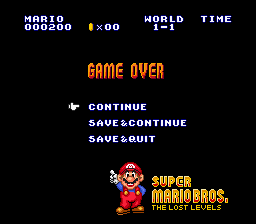 The subtitle reappears in Super Mario Bros. Deluxe's "Super Mario Bros.: For Super Players" mode, which is another remake of the Japanese SMB2. Another change inside the logo box is the added trademark symbol in the U.S. version. 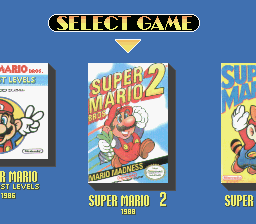 For the American SMB2, the Japanese version has one more copyright date on its title screen.